JACKSON, Miss. 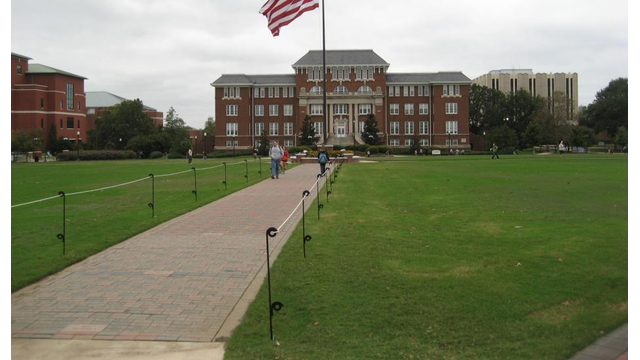 (AP) - Authorities at Mississippi State University say they have arrested a person who reportedly was carrying a gun on campus and that no injuries have been reported. MSU spokesman Sid Salter told The Associated Press in a phone interview Thursday that the person had been arrested. He declined to give any further information. The university had issued an online alert shortly after 10 a.m. saying a gunman had been reported near Carpenter Hall, which houses MSU's mechanical engineering department and overlooks the Drill Field at the heart of the 20,000-student university in Starkville. The gunman was later reported near Lee Hall, the university's main administration building. MSU advised students to remain sheltered even after it reported the person's arrest. The school said on Twitter that classes were suspended until 2 p.m.